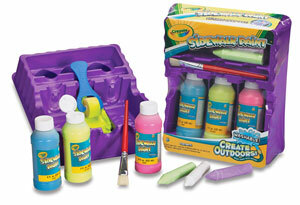 With this sidewalk set you can create art, games, signs, or messages on sidewalks, driveways, or blacktop. It includes three 8 oz (237 ml) bottles of washable Sidewalk Paint, a three cavity tray, a paintbrush and roller, and three sticks of Crayola Sidewalk Chalk. Washes off easily with water. Non-toxic.